Foundation is one of those things that even though I'm pretty happy with my current line up, and am pretty certain I've found my Holy Grail, there's always space for one more. Always. You know, there might be something even better out there. Lately I've got a really good roster of creamy bases on the go that seem to fit every skin situation so I thought I'd share them with you. The Barely There Base - Illamasqua Skin Base Foundation (£32) gets a lot of praise for being as skin-like as you can get in foundation terms. It's pretty creamy and melts nicely into the skin, and I find that once it's on it's hardly detectable. Not quite matte yet definitely not dewy, this is one that I always go to when I want something unfussy and light. Sitting in the light-medium coverage camp, Skin Base gives a natural finish. I find it doesn't quite cover blemishes, so I turn to this one when things are good. The Lit From Within Glower - Burberry Fresh Glow Foundation (£35) has graced my mug more times than I care to mention in recent weeks. Still light-medium, but really nice and buildable and long lasting, Fresh Glow covers more than Skin Base does but still feels light and comfortable on my skin. It somehow manages to add radiance without being overly dewy and perks up my skin which has been a bit dull lately *shakes fist at winter*. The New Recruit - YSL Le Teint Touche Eclait Foundation (£30.50) made its sneaky way into my into my stocks a few weeks ago and I'm still getting to grips with it. It's based on the formula of the Touche Eclait highlighting pen and aims to add radiance and glow to the skin. It's a light formula that does make my skin dewy but I'm not reaching for it as much as the others just yet. The lasting power isn't as good as Fresh Glow, maybe because it's such a creamy dewy base. I need to give this a bit more of a try I think as some foundations don't always click straight away. 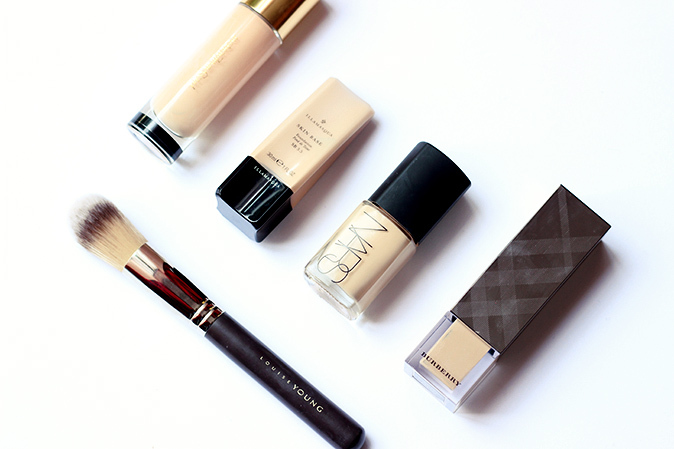 None of these are particularly purse friendly annoyingly, but foundation is one thing I always struggle to find more affordable decent light shades in. Have you tried any of these and do you have a few go-to bases? The post A foundation line-up worth your time (and money) appeared first on Lelore.